U.S. District Judge Richard Seeborg rules against the administration's policy of returning asylum seekers to Mexico as they wait for a court to hear their cases. A federal judge decided Monday to block the Trump administration’s policy of returning asylum seekers to Mexico as they wait for an immigration court to hear their cases, but the ruling is on hold for several days. U.S. District Judge Richard Seeborg in San Francisco granted a request on behalf of 11 asylum seekers from Central America and legal advocacy groups to halt the practice while their lawsuit moves forward, but he held off on enforcing his decision until Friday to give the government a chance to ask an appeals court for a review. 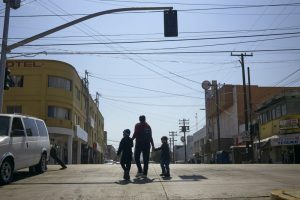 The policy lacks sufficient protections to ensure migrants don’t face “undue risk to their lives or freedom” in Mexico, the judge said. Seeborg also said a law that President Trump’s administration cited as its authority to send back migrants does not apply to asylum seekers such as those who sued. The launch of the policy in January at the nation’s busiest border crossing – in San Diego – marked an unprecedented change to the U.S. asylum system, government officials and asylum experts said. Families seeking asylum typically have been released in the U.S. with notices to appear in court.